Ehrlichiosis ewingii infection  is an infectious disease caused by an intracellular bacteria, Ehrlichia ewingii . 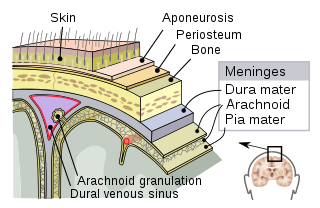 The infection is transmitted to humans by the tick, Amblyomma americanum . 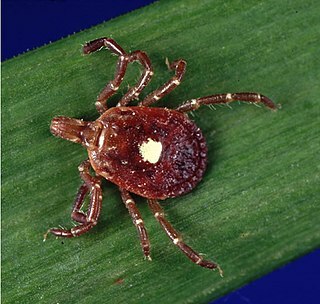 This tick can also transmit Ehrlichia chaffeensis , the bacteria that causes human monocytic ehrlichiosis (HME). Patients can present with fever, headache, myalgias, and malaise. Laboratory tests may reveal thrombocytopenia, leukopenia, and evidence of liver damage. In endemic areas, a high index of suspicion is warranted, especially with a known exposure to ticks. The diagnosis can be confirmed by using PCR. 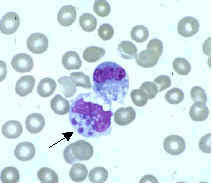 A peripheral blood smear can also be examined for intracytoplasmic inclusions called morulae. The treatment of choice is doxycycline. ↑ Patnaik MM (June 2009). "Inclusion bodies in tick-borne diseases diagnosed in patients from northern Wisconsin". Clin Med Res. 7 (1–2): 45–7. doi:10.3121/cmr.2009.807.818. PMC 2705270 . PMID 19574488. ↑ Paddock CD, Folk SM, Shore GM, et al. (November 2001). "Infections with Ehrlichia chaffeensis and Ehrlichia ewingii in persons coinfected with human immunodeficiency virus". Clinical Infectious Diseases. 33 (9): 1586–94. doi:10.1086/323981. PMID 11568857. ↑ Xiong Q, Bao W, Ge Y, Rikihisa Y (April 2008). "Ehrlichia ewingii infection delays spontaneous neutrophil apoptosis through stabilization of mitochondria". The Journal of Infectious Diseases. 197 (8): 1110–8. doi:10.1086/533457. PMID 18462160. ↑ Gusa, Aa; Buller, Rs; Storch, Ga; Huycke, Mm; MacHado, Lj; Slater, Ln; Stockham, Sl; Massung, Rf (Nov 2001). "Identification of a p28 gene in Ehrlichia ewingii: evaluation of gene for use as a target for a species-specific PCR diagnostic assay" (Free full text). 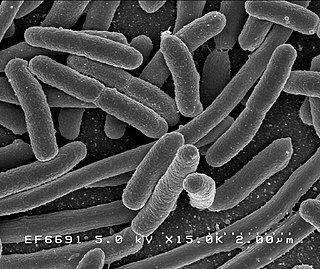 Journal of Clinical Microbiology. 39 (11): 3871–6. doi:10.1128/JCM.39.11.3871-3876.2001. PMC 88457 . PMID 11682500.